Raisins are formed by the drying of grapes. Raisins are considered to be the second-most important product of grapes after wine production. When the water content of grapes is reduced to 15%, they are considered as raisins. Raisins are mostly solar/air dried in fields. Raisins are used in many regional dishes, cuisines, desserts, and bakery products. In the global raisins market, Turkey and the U.S. hold prominent market shares as far as the production of dried grapes is concerned. Turkey is the world's largest producer of raisins, and their production was 429,000 tons in 2014, a remarkable growth of 27% since 2000. Followed by Turkey, major producers of raisins are the U.S., Iran, China, and Chile. In the global raisins market, majorly consumed raisins are natural seedless raisins, which also have many applications in food and beverages. In addition, raisins are used in the garnishing of food dishes to enhance their texture, aroma, and taste. The health consciousness wave has inundated the global market with nutrition-rich foods and beverages, with an authentic brand commitment to quality, taste, and flavor. In the global market, raisins have gained significant applications in households, food processing industry, and baking industry, Raisins are also very popular among food service providers, owing to their multiple health benefits and good taste, which is helping them in attaining customer attraction. With the frequent launching of food products, the dried fruit market has become more competitive, and manufacturers are following the customer-centric approach to become leaders in the raisins market. Many food manufacturers are very keen on incorporating raisins in their products to enhance the organoleptic properties of their products. Consumers are increasingly moving towards food products that are made from natural ingredients without any chemical or artificial additives. There is also a noticeable shift towards the consumption of dried fruits such as raisins. Manufacturers are developing products with natural ingredient compositions and reduced processing to cater to the burgeoning consumer demand for nutritional and sustainable foods. They are also offering convenience and on-the-go foods with a healthy twist to satiate the millennial palates of consumers. Many food companies are using raisins in their products, and introducing different types of snacks and bakery products consisting raisins; they can be used as toppings in various bakery products, which add the essence and good flavor of the raisins to the particular food product. Dried raisins is the most common dried fruit, and are widely used in various bakery products to increase their flavor and nutritional value. With the increasing flavor inspiration and demand for healthy food ingredients in food products, food manufacturers are emphasizing on incorporating healthy foods in their final products to cater to the demand from their broad range of customers. In the bakery industry, raisins are used in baked goods to enhance their texture and flavor. Incorporating raisins in bakery food products imparts a tangy flavor to these products, and also add to their nutritional value. Over the last few decades, there has been a noteworthy boom in the bakery industry, which directly results in the increased demand for raisins among manufacturers in this industry. Innovation in the product line and frequent product launches have made the raisins marketplace more competitive than earlier, which compels manufacturers incorporate natural and healthy food ingredients into their product lines to become leaders in the market. Growing economies have increased the essence of customization in final products. Manufacturers are now using mass customization as a strategy to fulfill the demand of their broad range of customers. The same trend is also being followed in the breakfast cereals market. According to data published in 2013, the varieties of morning breakfast cereals have increased from 160 varieties in 1970 to 340 varieties in 2012. In order to increase the variety of breakfast cereals, manufacturers are utilizing dried fruits as an ingredient in morning breakfast meals to fulfill the nutritional demand. Raisins are one of the most commonly used dried fruits that are incorporated in breakfast cereals. The demand for breakfast cereals has gained substantial pace in the Pacific Rim, owing to changing lifestyle patterns and Westernization that have had a deep impact on the population. Fast-paced life is also an important factor that had led to the increased consumption of breakfast cereals. In the shadow of the increasing demand for breakfast cereals, the demand of raisins is also increasing, and it can be anticipated that, over the forecast period, there would be high demand for raisins in breakfast cereals. The proposed market report of TMR on the global raisins market evaluates the opportunities in the current market, and provides updates and insights corresponding to different segments involved in the global raisins market over the forecast period 2018-2026. The global raisins market report further exhibits the estimated data for 2018, and forecast data up to 2026 in terms of value (US$ Mn) and volume (MT). In terms of value, the raisins market is anticipated to increase at a CAGR of 5.4% during the forecast period. The present study exhibits the trends and market dynamics of the raisins market in five major regions - North America, Latin America, Europe, Asia Pacific, and the Middle East and Africa. The report also includes the study of the current issues with consumers and various future opportunities for the raisins market. The report explores the global raisins market for the period 2018–2026. The primary objective of the report is to provide insights into the key developments in the market that are consistently supporting the transformation of global businesses that are associated with raisins. It is very important to consider that, in an ever-wavering economy, we provide the estimated (Y-o-Y) year-on-year growth rate in addition to the Compound Annual Growth Rate (CAGR) for the overall forecast, to better understand the analysis and evaluation of the global raisins market, and to discover equitable opportunities. Yet another key feature of this report is that, the estimation of the global raisins market and the corresponding revenue forecast is carried out in terms of absolute dollar opportunity. This is usually not prioritized while forecasting overall market numbers. Absolute dollar opportunity analysis is very essential in evaluating the degree of opportunity that a provider can observe to execute, as well as to contrast the potential resources from a sales perspective in the global raisins market. The report starts with an elaborate executive summary, the market definition of various segmentations that are included, and their respective shares in the global raisins market. The report further incorporates the major macroeconomic factors that have an effect on the growth of the raisins market. 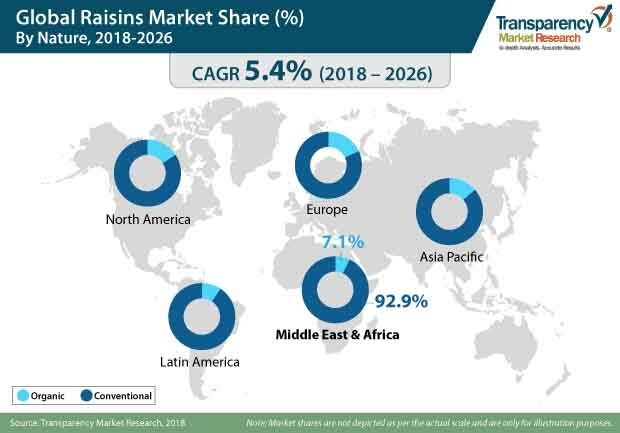 The report also highlights the various market dynamics, which includes the drivers, restraints, opportunities, and trends in the global raisins market. The report further underlines the study of the present issues with industrial processing and opportunities for the growth of raisins market. It also encompasses value chain analysis that provides a structural view of overall profitability from the manufacturers to the end users of the raisins market. It also comprises detailed information about the recent technologies that are used in the drying process of fresh grapes to make high quality raisins. In order to provide users with a clear view of the global raisins market, we have exhibited a competitive analysis of key market players and their strategic expansions. The competitive dashboard presents a detailed comparison of raisin manufacturers on valuable parameters such as key product offerings, total revenue, key developments, and key strategies. The study intensifies the global raisins market attractiveness analysis by product type, nature, end user, distribution channel, and region. To give deep-dive information about the global raisins market, the report also provides trade analysis. The report comprises the top five major countries that have a major share in the production and consumption of raisins. In addition, the report also enlists major exporters and importers to obtain deep insights about the demand and supply of raisins across the world. To evaluate the overall market size of raisins, the report considers various fundamental aspects based on secondary research. Furthermore, it emphasizes quantitative evaluation such as market shares by product type, nature, end user, distribution channel, region, and other qualitative data from primary respondents, which have been consolidated to arrive at clear and accurate market estimations. The forecast presented in the raisins market report arrives at the total revenue being generated, and the expected revenue contribution in the future by the global raisins market. Detailed profiles of companies that manufacture raisins are included in the report to analyze their developmental strategies, key product offerings, and recent developments, as they have a significant role in the global raisins market. Major market players covered in the raisins market report are Bergin Fruit and Nut Company Inc., Sun-Maid Growers of California, Sunbeam Foods Pty Ltd., Geobres Nemean Currants and Sultana Raisins S.A., Decas Cranberry Products, Inc., Kiantama Oy, Sunsweet Growers Inc., Red River Foods Incorporated, N. POLYCHRONIADIS & SIA O.E., Citadelle Maple Syrup Producers’ Cooperative, Traina Foods, Inc., Dole Food Company, Inc., Lion Raisins Inc., Fujian Lixing Foods Co., Ltd., JAB Dried Fruit Products (Pty) Ltd, N. Sunshine Raisin Corporation, Jiangsu Palarich Food Co., Ltd., Ocean Spray Cranberries, Inc., Montagu Dried Fruit And Nuts (Pty) Ltd, Vkc Nuts Private Limited, Viva Bella Orchards Inc., and others.